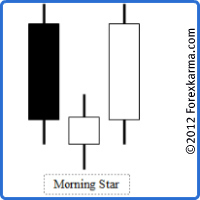 The Morning Star candlestick pattern is a powerful bullish candlestick reversal pattern. It consists of three candles. It occurs in a downtrend siginfying that the end of the downtrend is near and the beginning of the uptrend is in process. This reversal pattern must occur in a downtrend. This reversal pattern must consists of three candles. The first day candle must be a full black (bearish) bodied candle. It must close lower than the previous low confirming the downtrend. The second day candle consists of either indecision Spinning Tops or the Doji. The third day candle must be a full white (bullish) bodied candle, i.e. the close price must be higher than the open price. The third and the last day candle of this pattern must also close higher with the close price above the midpoint of the first day candle. The opposite is true for the case of the evening star candlestick pattern. The text book perfect the Morning Star is formed infrequently. Sine the candlestick analysis is a subjective notion, the details on the formation of candlestick reversal pattern as explained above might change from one trader to another from their viewpoint of experience and knowledge base. For example, the second day candle could be a single indecision candle like doji or spinning top or combinations of more than one indecision candles. Even though we stated three candles required for the formation of the morning star candlestick pattern, some traders might as well consider two or even more Spinning Tops or the Doji for the middle candle.